What are the distinctive features about the characters, setting, and plot of this book? To what extent does Jonah’s story remind you of yourself or someone you know or is this story unique to him? How do characters change or evolve throughout the course of the story? What events trigger such changes? Can you relate to the characters’ predicaments? Is the mother irresponsible by straying away from the path and the group? Is the father’s spirit broken? Does he fall victim to his own tales and delusions? Why does Jonah seem to be guilt-ridden and what factors contribute to his guilt? What do you think is the source of Sevantz’s and Nersotz’s hatred toward Jonah? 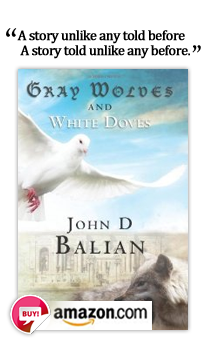 Why do you think the author chose the title Gray Wolves and White Doves? What is the meaning (in Armenian, Turkish, or English) of the names of some of the characters? Could they be veiled references to a character’s role in the story, the author’s own relationships and experiences as a youth, or Biblical figures or events? What scenes are reminiscent of the New Testament or other Biblical events? Why are photographs so significant to this story -- the complete absence in certain cases, the predominance in some, and inferences in yet other scenes? Why is the Armenian Genocide referred to as the “forgotten genocide”? Who stated, “Who now remembers the extermination of the Armenians,” and in what context? What are the common elements of the first genocide of the 20th century, the holocaust, and the last genocide of the 20th century? The Book “The Forty Days of Musa Dagh” is a 1933 novel by Austrian-Jewish author Franz Werfel based on the valiant self-defense at a mountain top (Musa Dagh---Mountain of Moses) by a small community of seven Armenian villages against the deportation orders of the Ottoman Empire in 1915 during the height of the Armenian Genocide. What is this rebellion’s connection to Masada? Is the author trying to put the history of the genocide in context of “history repeating itself”? Is it an age-old problem that he is trying to help modern-day readers understand? How do survivors of a national calamity such as genocide and victims of ethnic cleansing pick up the pieces, move on, and reconnect with their kin and re-enter human society? How do they overcome the all-consuming sense of shame and survivor’s guilt? Should they succumb to the enticing notions of assimilation into the nationalities and peoples of their new host countries? How do empires and dominant ethnicities/races/nations justify their sense of entitlement to the belongings (and in fact to the actual lives) of the weaker and docile subjects that are different than their own? Throughout the Ottoman history the ruling Turkish tribes, governments, pashas, and sultans appropriated not only properties but also levied a “head tax” -- took children from their non-Turkic subjects such as Armenians, Greeks, Assyrians, etc., at a young age and indoctrinated them to become Muslim Turks. Some were enlisted into the infamous and powerful Janissary ranks (private armies of the Sultan). Also, it is well documented that during the genocide, more than two hundred thousand young Armenian women and children were enslaved into Turkish and Kurdish homes as servants or concubines. Is the kidnapping of the aunt and later the half-brother a reference to the head tax and the stolen children during the genocide? Why has the term “Young Turks” been distorted in the American lexicon from a genocidal, barbaric notion to one that is glorified as agents of change, especially in the context of sports, business, and politics? Do you think the events of September 11, 2001 influenced how the author shaped the story? The history of the Middle East is interwoven with persecution of many diverse ethnic groups. Early in the book Hanna (later Jonah) was told he should pretend to be Assyrian and not Armenian, then to hide all identities, yet later he is asked to affirm his Armenian heritage and hide his Assyrian upbringing, and ironically at one point in Europe when he claims to be an Armenian the official states categorically that it is irrelevant since his nationality is Turkish. Do you think the author is trying to help the reader understand the various levels of discrimination, bigotry and hatred that exist between various groups of people today and/or is he highlighting that bigotry is prevalent and indolent among all peoples, ready to be released at an opportune moment and against anybody? Is the survival impulse in humans so powerful that even a young boy at a tender age is able to instinctively navigate through the Byzantine quagmires he faces? This is a story of overcoming adversity. Do you think the author is attempting to illustrate the importance of adults helping young people coming from disadvantaged circumstances to realize their true potential? A disclaimer in the book says that while the story is based on actual events, any similarity to real persons is coincidental. Is this story a recounting of the author’s own early life experiences? How much of the book is historical and how much is autobiographical? Where does fact end and fiction begin? What do you think is the author’s main intent of writing this book? Is it simply a coming of age story, or do you think he additionally wants to educate readers about the consequences of policies of denial: pernicious bigotry, perils of revisionist history, cultural genocide, etc.? Is this story an artifact or are its main themes a persisting challenge to powerful nations and people in authority positions? How has reading this book changed your opinion of human behavior or lead you to a new understanding or awareness of history and some aspect of your country, community, family, and your own life?